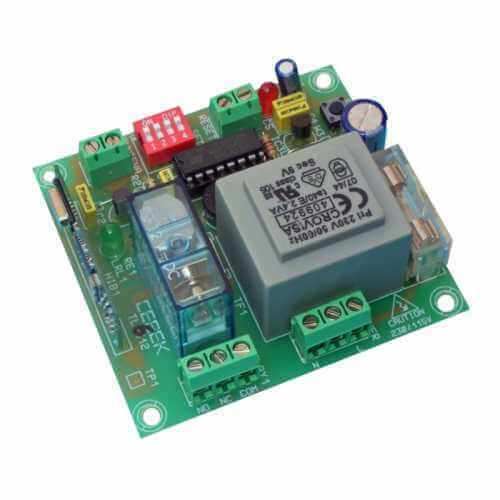 The Cebek TL-612 is a 1-Channel 230Vac mains powered Momentary, Toggling/Latching or Delay Timer RF relay receiver module. TIMER MODE: relay activates for a user adjustable on-time of between 0.1 and 132 Seconds. Timer is a non-cumulative retriggerable type. Any further button presses made while the timer is active will restore the full delay time (non-cumulative) without interrupting the relay. If no new triggers are received before the delay timeout is reached, the relay will turn off and the board reset ready for a new trigger signal. Reset Input: immediately turn off (or disable) the relay output (all operating modes). Connect to volt-free contact closure like a switch, manual over-ride button, etc. The relay is disabled while the Reset input remains closed.